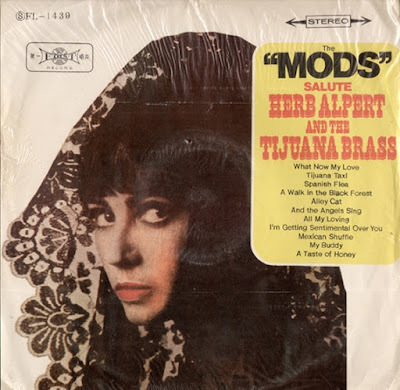 Herb Alpert and the Tijuana Brass sold more albums than almost anyone else in the '60s, so it's no surprise that any goofball with a trumpet would try to cash in on their effortlessly enjoyable, upbeat, instrumental style. And, indeed, there were plenty of those. Making a vocal album, however, is another story. Who in their right mind would attempt an entire album of singing new words to famous instrumentals? But that is what Big Band veterans the Modernaires did, setting lyrics to Alpert & Co.'s numerous hit tunes (apart from songs like "All My Loving" that, of course, already had lyrics). The tight-harmony vocal quintet used to sing with the likes of Glen Miller back in the '40s, so presumably this was their attempt to get, er, "mod." Of course, it's utterly ridiculous, even more removed from anything resembling actual Mexican music than even Alpert was. But like the TJ Brass itself, it's so gosh-darn HAPPY! that it's hard to resist. No slow songs here. But no parka-clad British youth riding scooters either. Member of the Hollywood session all-stars The Wrecking Crew perform on this, inc. Tommy Tedesco, possibly the most recorded guitarist ever. I was reminded of this album, and Alpert in general, whilst recently visiting Herb's spectacular restaurant, Vibrato. From the minute we walked in, an instro combo was serving up cool jazz and Latin lovelies like "The Girl from Ipanema," "Besame Mucho", "The Peanut Vendor," and a famous '60s groover I could not place (Horace Silver? Oscar Peterson?) From the drink menu, I passed on the 'Tijuana Taxi' and ordered 'The Spanish Flea.' Muy bueno, as were the lamb chops. And actor Jon Voight called our daughter "beautiful." So happy Fathers' Day to me, eh? Oh, you found this one, too! I picked up a U.S. mono Lp and thought it was some kind of UK rock group doing covers of the TJB, but my jaw dropped when I found it was a '40s pop/jazz vocal group. Bizarre! I have always loved Herb Alfred. It is very happy music so its good that someone might start a bit of a revival of interest in it.